Watashi no nihon ikio taskete kere te arigato gozaimasu. 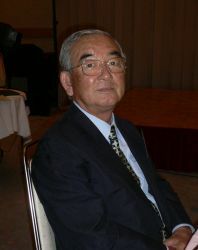 Kono tabio tsugite Watashiwa takusano hito to shiriai ni nari, idaina bunka o shiri mashita. Watashi wa takusano kei keng wo shi, sore o kano nashita Rotary Club ni kansha shimasu. Jo zuni nihon go wo hanasuko to wa deki masen desita ga daiji da to omoi mashita. Nihon no gako ni ittari, kaiten zushi ni ittari, karaoke bokkus de utattari shimashita. Yoshida ke ni taizai shita koto mo ohkina yorokobi desu. 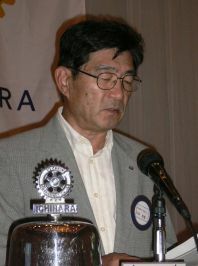 Korera wa subete Rotary Club no tasuke nashi ni wa deki masen deshita. Mouichido orei o iwasete kudasai. Mata mouichi do nihon ni modotte kitai desu. kara no purezento no pin desu. President Toshio Kato-san, Past District Governor Hiroshi Saito-san, Governor Elect Masataka Shiratori-san, International Service Director Eishi Saito-san, Past Presidents, my good friend PP Yusao Kamijo-san, Rotary Spouses & my Fellow Rotarians and good friends of Ichihara. It has been quite a few years since my last visit to Ichihara and let me say how happy my wife Elsie and I are to be here once again to renew the relationship we have with our many friends in this lovely city of Ichihara. I have not been able to attend your club anniversary in the last few years mainly because of my duties to Rotary International. I bring greetings from the President Mr Harjit Singh and all the members of the Rotary Club of Petaling Jaya, especially Teo-san and also to congratulate President Toshi Kato and the new board of directors of RC Ichihara on becoming the leaders of the club for 2005-06. 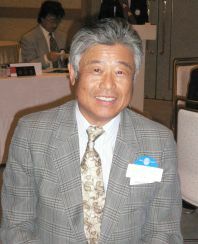 I am also very happy to know that Mr Shiratori has been elected as District Governor of District 2790 for Rotary Year 2006-07. Congratulations Shiratori-san on your achievement of this high position in Rotary International. I am sure your will find the experience very rewarding and enjoyable. The relationship between the Rotary Club of Ichihara and the Rotary Club of Petaling Jaya has been a long and close one, going back some 30 years. This relationship has been made stronger because of the Students’ Exchange program between our two clubs. I hope we can continue this program for many more years. 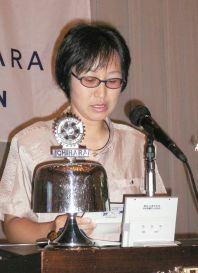 The Rotary Club of Petaling Jaya will be happy to host any students the Rotary Club of Ichihara wants to send. I have been asked to speak to you about the Rotary International Centennial Convention in Chicago. Although Rotary International celebrates the Centennial Convention in 2005, this is not the 100th convention of RI. It is, in fact, only the 97th. The first convention of Rotary International was held in 1908 after the formation of the International Association of Rotary Clubs, the predecessor of Rotary International. It is appropriate that the Centennial Convention should be held in Chicago because Rotary started in Chicago when Paul Harris first met with three other friends. I will make a pictorial presentation of the Chicago Convention, showing you a bit about the city of Chicago, the Centennial Parade and the convention itself. Chicago is a beautiful city, called the “Windy City” not because of the wind blowing over Lake Michigan from Canada but from the politicians from the city. Chicago is an important city in the politics of the United States and its politicians always talk a lot. For this reason Chicago has been known as the “Windy City” meaning that people from the city talk a lot. Chicago is a very interesting city to visit. The architecture of many of the skyscrapers of Chicago is very interesting. A big fire destroyed the center of Chicago in 1871. The fire gave well-known American architects the chance to design very beautiful buildings for the city. Although the city has some lovely beaches, the city is not by the sea but by one of the largest of the five great lakes of North America – Lake Michigan. It is very hot in the summer but in winter it gets very cold, with a lot of snow. A visit to Chicago for any Rotarian is not complete without a visit to the Rotary International World Headquarters in Evanston, which is about 25km from Chicago City, 45-minutes by car. One Rotary Center is an 18-storey office building much like any other office building. Just outside the building is a sculpture of RI President Carlos Canseco who in 1984 launched the Rotary PolioPlus program to eradicate polio by the year 2005, the centenary of Rotary. The lower levels of One Rotary Center are rented out to corporations as offices and the upper levels of the building house the Rotary International World Headquarters. RI World Headquarters is much like any other office with almost 400 staff. The interesting part of RI World Headquarters is in the reception area where a life-size statue of Paul Harris is located. There is also a replica of Paul Harris’ office, complete with all the original furniture. During the convention many Rotarians took the opportunity to visit One Rotary Center. This is a view from the top floor of One Rotary Center looking towards Chicago City during the wintertime. Another site to visit is the place where the first Rotary club, the Rotary Club of Chicago meets. It meets at the Chicago Athletic Association building on South Michigan Avenue, the main street of downtown Chicago. As you can see, it meets on Tuesdays, at 12.10pm. One of the major differences between the Chicago Centennial Convention and other conventions is the Rotary Centennial Parade. Rotary clubs and districts from all over the world were invited to participate in the parade. This was held in the center of the city. As you can see, it was quite a grand parade and it took two hours to complete. The parade featured flower floats by various countries, marching bands, dancers, etc. Most of us did not attend the functions held in conjunction with the convention. Past experiences have not been good. These are always expensive and also short of food. The one interesting event is the “Race To The Finish” To Eradicate Polio. This is a 8km run or 5km walk. Although we did not take part, 4,000 participants took part and raised US Dollars fifty thousand for PolioPlus. This is a picture of Cindy Moore of Cincinnati, Ohio, who won the women’s 8km run at a time of 36.01 minutes. The convention and workshops were all held at the McCormick Place, a very large convention center. Access to the convention center is by bus, train or by taxi. However, after any of the convention event, there is a very long line for taxis. It takes about one and a half hours to wait in line for a taxi. So, we either take the buses provided by the organizers, train or by public buses. Most of the time we take the convention bus or public bus because this is faster. Dressing during the convention was very casual. The weather was very warm, so most Rotarians did not use jackets but casual clothes. No convention of Rotary International is complete without the House of Friendship where Rotarians gather in leisure to renew old friendships, make new ones, shop and have fun. One of the features of the House of Friendship are the cultural performances put up by Rotarians from various countries. Rotarians took the opportunity to buy the Rotary centennial book, One Hundred Years of Service. Past RI Presidents were there to sign the book. Every day a Daily Bulletin is published, giving highlights of events for the day. Here’s a picture of a taxi line. One of the emphases of the convention is the Young People who are the future of not only Rotary but also the world. Here we have young children bearing flags of the countries represented at the convention, Youth Exchange, Rotaractors, Interactors and RYLArians. The main convention hall itself is very large, capable of seating some 20,000 people at a time. Acting as M.C. for the convention was Rotarian Roger Climpson of the Rotary Club of Lane Cove, New South Wales, Australia. He is a famous television and radio personality in Australia. A total of 41,792 delegates from 161 countries attend the Chicago Convention. During the opening ceremony young people on bicycles presented the flags of all Rotary countries. Rotary is now in 168 countries – two new countries having been added: Equatorial Guinea and Tajikistan. The entertainment at the Opening Ceremony featured dancers from South America, especially Brazil, and performances by young people – the Chicago Children Choir, the Trinity Irish Dancers and many other performances. The families of RI President Glenn Estess, Sr and RI President-elect Carl-Wilhelm Stenhammer were presented, and RI President-nominee William Boyd and his wife Lorna. Past RI Presidents and their wives were also presented at the opening ceremony as well as the RI Board of Directors, and the Trustees of The Rotary Foundation. RI President Glenn Estess, Sr presided at the convention. The President of the United States of America George W Bush gave his congratulatory message on video and so did the Mayor of Chicago Michael Daley, Secretary-General of the United Nations Kofi Annan, and a member of The Beattles Paul McCartney. Mr Ted Turner, founder of the worldwide news television channel CNN. An entrepreneur and philanthropist, Ted Turner has donated US Dollars one billion to the United Nations for humanitarian purposes and US Dollars five hundred million for PolioPlus. He delivered an inspiring address on the need to help the billions of uneducated people, people with no food or good drinking water, people who are sick. He also criticized the US Government for not doing enough for needy countries, especially in Africa, and needy people. He estimated that to educated people, provide food and drinking water to the starving, provide medicine for the sick would cost only US Dollars sixty one billion a year. This is only about five percent of the US Government military budget. A feature of the convention was the on-stage interview of various groups of Rotarians – Women in Rotary. Here we see PDG Carolyn Jones of Alaska and PDG Rosemary Aragon of District 9030, USA. PDG Carolyn Jones is a Trustee of The Rotary Foundation, the first woman to be appointed as trustee. Talking about a water project in Sudan. RYLA participants talking about an environmental community service project. Rotaractors of Nepal who climbed Mount Everest presenting a Rotary Centennial banner to RI President Glenn Estess. Another keynote speaker was Dr Jong-wook Lee, Director-General of World Health Organization (WHO) who spoke on the battle to eradicate polio. Although it has been the aim of Rotary International to have the world declared free of polio by WHO in 2005 when Rotary celebrates its centenary, recently new polio cases have reappeared in Nigeria and the disease has spread to neighbouring polio-free countries in Africa. This is a great concern and we, as Rotarians, must continue to work hard to make sure that the battle against polio is won. Apart from the plenary sessions each morning there are also workshops in the afternoon. While some Rotarians attended these workshops, most Rotarians took the opportunity to sightsee or do shopping. By the time of the Closing Ceremony many Rotarians had left Chicago to continue their tour of the US. Most of the Rotarians from Malaysia had left to go to the Niagara Falls, New York City or Los Angeles. Teo-san, his wife Karen, my wife Elsie and I decided we would stay for the closing. We were not disappointed with the closing because we had the chance to listen to the famous three American Tenors – Cook, Dixon & Young. RI Annual Convention for 2006 will be held in the twin-city of Malmö, Sweden and Copenhagen, Denmark. This will be held on 11-14 June 2006. This is the bridge linking Malmö, Sweden and Copenhagen, Denmark. Many of us had look forward to the Rotary Centennial Convention in Chicago. However, we were somewhat disappointed that the convention itself was much like any other convention with the exception that there was a centennial parade. This was interest and added a lot of colour to the convention. Chicago is an interesting city to visit. To me this is probably the most interesting city in the United States I have visited, much more interesting than New York City, Los Angeles or San Francisco. Next year’s convention in the twin-city of Malmö, Sweden and Copenhagen, Denmark will also prove interesting since this will be the first time when a RI Annual Convention is held on the border of two countries. I hope I have given you an impression of Rotary International Centennial Convention in Chicago and the events marking the 100th Year celebrations of Rotary. My wife Elsie and I want to thank you for your hospitality and warm welcome. I want especially to thank my good friend Past President Kamijo-san and his wife Yoko for making our visit to Ichihara so interesting. Finally, may I, on behalf of President Harjit Singh, the Board of Directors and members of the Rotary Club of Petaling Jaya, extend to you, President ----- and all our friends of the Rotary Club of Petaling Jaya to visit Malaysia again in the coming year. It has been some years since you have visited Malaysia and we hope to welcome you to our city and country in the near future.